Since 1900, our dedicated farmers have been producing quality milk with a little help 'from the girls'. Dairy Farmers offers a range of milk choices to suit all lifestyles. Pura has proudly been bringing quality to to Australians since 1935. With the combination of natural vitamins and minerals, not to mention a great creamy taste, Pura milk naturally provides essential nutrients for all the family. Pura milk comes in nine variants to suit every need and occasion. Masters is the largest Flavoured Milk brand in Western Australia and has been the taste of the West, produced locally in WA since 1964. Big M flavoured milk has a big history of flavours and active fun! Big M has been a big hit for Victorians since 1978. Moove has been a New South Wales icon since 1978. Moove comes in flavours we all love and pack sizes that suit different needs and occasions. Dare is a unique blend of Arabica and Robusta coffee and fresh milk that delivers a smooth coffee flavour with a real coffee kick. Our story began in 1988. At Farmers Union we believe in harnessing the goodness and simplicity of natural ingredients like milk, cream and cultures to create our deliciously simple yogurt that goes with just about everything. The Farmers Union Iced Coffee story started in a big decade for South Australia. Hot on the heels of bringing the pie floater and Cold Chisel to global prominence, 1977 saw Farmers Union Iced Coffee become the next South Australian invention to make a mark on the wider world. A much loved icon Farmers Union Iced Coffee is still proudly made in South Australian. 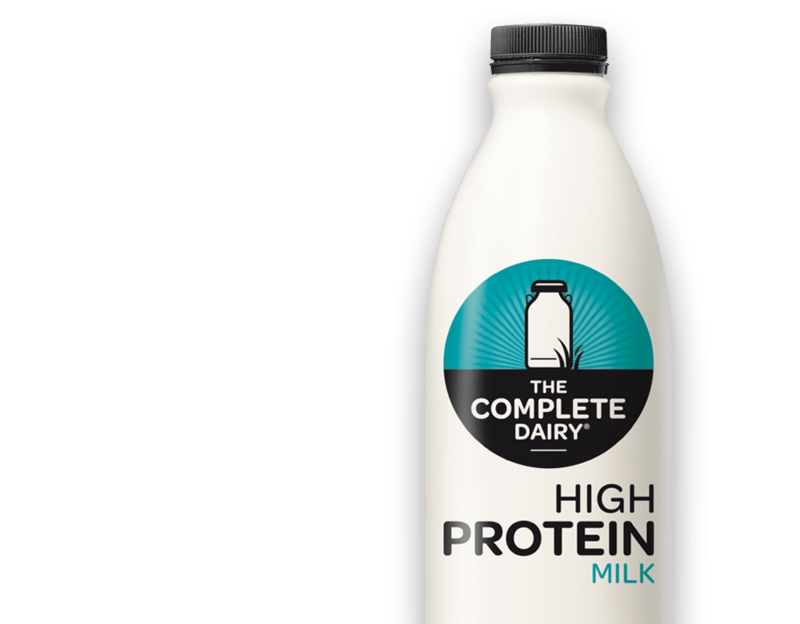 The Complete Dairy is an all-natural, high protein, lower lactose milk. Using a filtration process which naturally increases the protein and decreases lactose levels, it offers high protein milk in both full cream and light milk varieties. #Percentage Daily Intakes are based on an average adult diet of 8700kJ. For information on other Masters Milks check the pack label. For information on other Masters flavoured milks check the pack label. For Information on other Dairy Farmers Milk check the pack label. For information on other Dairy Farmers Thick & Creamy yoghurt check the pack label. For information on other Dairy Farmers Classic flavoured milks check the pack label. For information on other Pura Milks check the pack label. For information on other Pura Classic Milks check the pack label. For information on other Big M flavoured milks check the pack label. For information on other Moove flavoured milks check the pack label. For information on other Dare Iced Coffee products check the pack label. For information on other Farmers Union products check the pack label. When it comes to maintaining strong bones and teeth, calcium does the heavy lifting. This is the most common nutrient associated with milk - and for good reason! Milk contains the necessary calcium, ideal for not only growing bodies but essential throughout adulthood, to ensure your bones are healthy and strong well into old age, as part of a balanced diet. So raise your glass and enjoy Pura, Dairy Farmers & Masters milk. The benefits of iodine are more than skin deep; they go all the way to your brain! An essential nutrient found naturally in milk, as part of a balanced diet, iodine not only contributes to healthy skin but it is important for healthy brain function. Iodine also supports energy metabolism for your healthy, active body. Like calcium, phosphorus in milk is a vital mineral for the maintenance of your bones. As part of a balanced diet, this nutrient is crucial for energy metabolism, and plays an important part in keeping your teeth healthy – giving you every reason to smile! Hydration is important post exercise, but also when it comes to maintaining your overall health and well-being, and potassium is a key contributor! This essential nutrient assists in regulating your water and electrolyte balance, as part of a balanced diet, and helps maintain healthy nerve and muscle function. Potassium is also essential for kids, supporting their growth and development. Protein is a well-known essential nutrient for growth and development of muscles, as part of a balanced diet. Although it’s often associated with meat, dairy is a great source of protein too! The building blocks of protein are amino acids, some of which are made naturally in our bodies but some need to be ingested in the food we eat. Protein is also needed to maintain healthy bones. Easy on the eyes, as part of a balanced diet Riboflavin (or Vitamin B2) is an essential nutrient to maintain healthy eyesight. Along with helping maintain normal vision, as part of a balanced diet, riboflavin helps the release of much-needed energy from food. This nutrient is especially beneficial for children, assisting in their growth and development. Feeling flat? Vitamin B5 is an essential nutrient found in milk that assists in reducing tiredness and fatigue. As part of a balanced diet, vitamin B5 also naturally contributes to mental performance for a sharp mind. And, it supports energy production, ensuring your body can keep up with your busy lifestyle. Battle the fatigue and keep your energy up with B12! As part of a balanced diet, this essential nutrient works to help reduce tiredness and assist energy metabolism - so you can be your active and energetic best.